Access Health Care Physicians is proud to announce that the National Committee for Quality Assurance (NCQA) has stated that Dalton M. Benson, MD, has received NCQA Patient-Centered Medical Home Recognition (PCMH) for using evidence-based, patient-centered processes that focus on highly coordinated care and long?term, participative relationships. 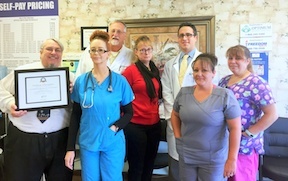 Dr. Benson has achieved recognition as a Level 3 Patient-Centered Medical Home. The office of Dr. Benson is located at 1903 Hwy. 44 West, Inverness, Florida 34453. Call 352-344-5500 to schedule an appointment. Dr. Benson earned his medical degree from University of Texas Medical School in Houston and completed internship and residency in internal medicine at the Medical College of Wisconsin affiliated hospitals in Milwaukee. Dr. Benson has a certificate of added qualifications in geriatric medicine and is a member of the American Geriatric Society. About NCQA: NCQA is a private, non-profit organization dedicated to improving health care quality. NCQA accredits and certifies a wide range of healthcare organizations. It also recognizes clinicians and practices in key areas of performance. NCQA’s Healthcare Effectiveness Data and Information Set (HEDIS®) is the most widely used performance measurement tool in health care. NCQA’s Website contains information to help consumers, employers and others make more informed health care choices. About Access Health Care Physicians, LLC: Access Health Care Physicians, LLC is a multi-service medical practice consisting of over 175 healthcare providers and over 915 employees at more than 110 locations throughout Florida. Our healthcare professionals provide a wide range of services not only in our offices but within patients’ homes. Yes, we make house calls.